The name poison oak given to the shrub-like forms of poison ivy and to at least two similar plants that are usually considered separate species of the cashew family, Anacardiaceae. Poison Oak can be a bush, vine, root, tree. 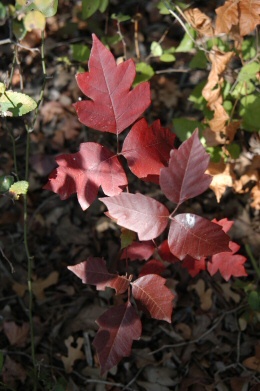 Poison Oak is usually not found above 4000 feet elevation (1219 metres). Poison oak in the southeastern United States, Rhus quercifolia, has leaves divided into three leaflets; the leaflets are densely haired and generally have three to seven distinct lobes. The white, berry-like fruits are also somewhat hairy. The poison oak of the U.S. Pacific coast, R. diversiloba, is a shrubby or sometimes climbing plant that grows to 2.4 m (8 ft) high; its three-leaflet leaves are toothed or lobed and are hairless. Both species contain poisonous substances that are believed to be identical or closely related to that found in poison ivy. Suffer. There are a few other things. If you don't do anything, you'll be totally miserable for about 2 weeks, maybe less, depending on how bad it is. Does Calamine lotion help? It may help a bit for minor affliction, but is basically worthless. Does hot water help? Hot water makes it feel better only so long as you are running hot water over it. As soon as you stop it feels a whole lot worse. Other people find that hot water can help. Vinegar compresses or rubbing alcohol helps. The mugwort plant is said to have a soothing effect on Poison Oak and may possibly prevent an outbreak if applied quickly.often. Bruise the Mugword leaves and rub on the exposed area. Poison Oak and Mugwort often grow near each other. Aloe vera from the plant helps dry it locally. Problem with poison oak is that is gets into your blood and comes out in other areas of the body... Hot water aggrevates, bright sunlight irritates and sweating makes poison oak it feel worst. Mud packs help to draw the poison out of the skin. Rinse with cold water. Homemade soap made from jewelweed, nettle, comfrey leaves, plantain, burdock, and aloe vera extracts and tallow, lard , olive oil, and lye.